Le Freak is a convergence of a Belgium Style IPA and a Belgium Trippel. Green Flash is a great brewery and Le Freak is one of their best. The beer packs a punch at 9.2% and is absolutely delicious. 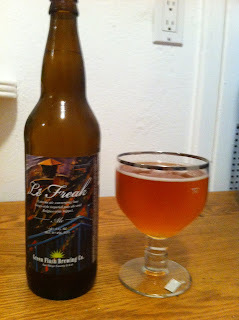 Le Freak has a distinct strong taste that is great to drink slowly. I probably drink this beer to much for my own good, but I just can't help myself. It is one beer I can say is worth every cent of the $9. Enough talk, just go get one and you will likely be hooked like me.